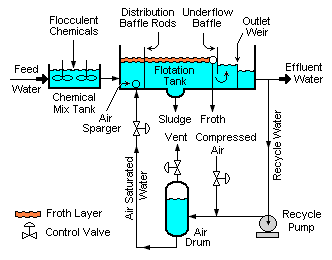 Dissolved air flotation (DAF) is a wastewater treatment process that clarifies wastewaters (or other waters) by the removal of suspended matter such as oil or solids. The removal is achieved by dissolving air in the water or wastewater under pressure and then releasing the air at atmospheric pressure in a flotation vessel. The released air forms tiny bubbles which adhere to the suspended matter causing the suspended matter to float to the surface of the water where it may then be removed by a skimming device. The feed water to the DAF flotation tank (also called the float tank] is often, but not always, first dosed with flocculent chemicals (such as ferric chloride or aluminium sulfate) to coagulate and flocculate the suspended matter. A portion of the clarified effluent water leaving the DAF float tank is pumped into a small pressure vessel (called the air drum) into which compressed air is also introduced. This results in saturating the pressurized effluent water with air. The air-saturated water stream is recycled to the front of the float tank and flows through a pressure reduction control valve just as it enters the front of the float tank, which results in the air being released in the form of tiny bubbles. The bubbles adhere to the suspended matter, causing the suspended mater to float to the surface and form a froth layer which is then removed by a skimmer. The froth-free water exits the float tank as the clarified effluent from the DAF unit. Dissolved air flotation is very widely used in treating the industrial wastewater effluents from petroleum refineries, petrochemical and chemical plants, natural gas processing plants and similar industrial facilities. In those industries, it is mostly employed as a secondary oil-water separation process following a primary API oil-water separator or other gravimetric separator. The process is also widely used in municipal wastewater treatment plants. Other users of DAF units are pulp and paper mills, vegetable oil processors, meat and poultry processing plants, dairies, textile plants, large laundry facilities, large bakeries and many other industries. A very similar process known as froth flotation is commonly used in the mining industries for processing of mineral ores. There are numerous other design configurations for DAF units. Some are rectangular steel vessels (as shown in the above diagram), others are circular steel vessels and many are made of concrete. Instead of a separate mixing tank for injection of the flocculating chemicals, some DAF units use lengthy, folded piping runs to provide the residence time for mixing and flocculation. Many DAF unit designs utilize parallel plate packing material to provide more separation surface and therefore to enhance the separation efficiency of the unit. However, all of the DAF units have in common the use of air (or other gas) bubbles to separate the oil and any suspended solids from the water. In certain areas where environmental regulations require DAF units to be covered so as to reduce emissions of volatile organic chemicals (VOC), an inert gas may be used rather than air to avoid formation of flammable conditions within the covered unit. ↑ 1.0 1.1 Milton R. Beychok (1967). Aqueous Wastes from Petroleum and Petrochemical Plants, 1st edition. John Wiley & Sons. LCCN 67019834. ↑ Lawrence K. Wang, Yung-Tse Hung, Howard H. Lo and Constantine Yapijakis (2004). Handbook of Industrial and Hazardous Wastes Treatment, 2nd edition. CRC Press. ISBN 0-8247-4114-5. ↑ Lawrence K. Wang, Yung-Tse Hung and Nazih K. Shammas (Editors) (2005). Physicochemical Treatment Processes, 1st Edition. Humana Press. ISBN 1-50259-165-0. This page was last modified 11:25, 12 September 2013.